The world’s most popular powered speaker – Updated! 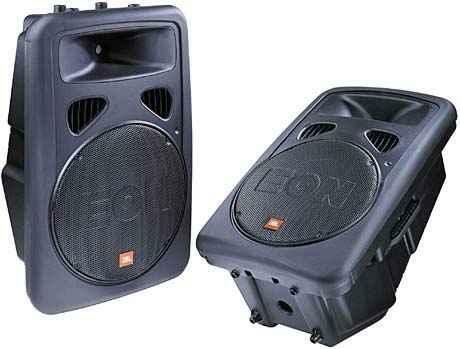 JBL introduced the first generation of EON speakers in 1995. Since that time, over 300,000 EON’s have been used in clubs, coffee shops, large halls, and outdoor venues around the world. It is the all-time best selling powered-speaker on the planet. The second-generation EON G2 series adds more power and improved versatility to an already proven product. One of the most significant enhancements over the original EON is the increased power stage. EON15 G2’s double the power of their predecessor with 300 Watts going to the low frequency driver. A dedicated 100 Watts feeds the high-frequency driver, as well. You’ll have all the headroom necessary to get that little extra boost in volume when the crowd is really digging your set. There’s no fear of driving the speaker too hard; all your tone will come through clean and distortion-free. More power means more heat buildup, especially in a small enclosure. JBL’s Thermomaster management system helps get rid of the excess heat while keeping the EON15 G2 compact and lightweight. Large heatsinks are too heavy and onboard fans are too noisy, so JBL engineers had to come up with a new cooling method. They decided, since the whole point of a speaker driver is to move air, why not use that principle to their advantage? The power amp is directly connected to an all-aluminum baffle, which provides structural support and draws heat away to special fins inside the acoustic ports. As air travels through the ports and across the fins, it naturally dissipates the heat, just like blowing on a spoonful of soup. When you crank up the volume, you’re pushing more air. The heat just floats away on the breeze! For singer/songwriters, folk duos, and other small groups, the EON15 G2’s improved onboard mixer puts all your sounds together in a portable PA system. Input 1 is a professional-quality XLR connection with mic/line selection. Inputs 2 and 3 are 1/4-inch TRS connections that add keyboards, guitars, drum machines, or CD/MP3 backing tracks to your vocals. Individual mixing controls and a two-band EQ let you blend and polish all the tracks as they travel to the speakers. With an EON15 G2 in one hand, a microphone in the other, and a guitar slung across your back, you’re ready to play anywhere. In addition to the input mixer, EON15 G2 speakers have a balanced XLR loop/mix output to build a bigger system, should you need one. Let’s say you’ve been asked to open for a band that has its own PA system. You’ve got vocals, guitar, and a drum machine, but the PA only has one unused channel. No problem. Tweak your sound using the EON G2’s mixer, then push it all out to the PA’s free channel. No one has to unplug or re-EQ, and everybody sounds their best. You can also use the loop/mix output to daisy-chain multiple EON speakers together. Use one as a monitor and a second as the front-of-house speaker, or use two EON’s with a stereo effects pedal for ping-pong delay on your guitar. Since each cabinet is powered, you don’t lose any volume when adding additional speakers.